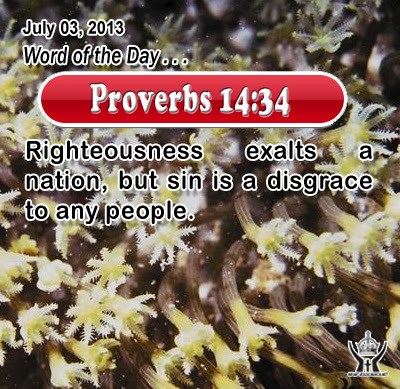 Proverbs 14:34Righteousness exalts a nation, but sin is a disgrace to any people. Heavenly Father, you are not only the Almighty, you are holy! Holy, Holy, Holy are you, the LORD God Almighty. May the whole earth be filled with your glory and may that glory be shown in what we do and say. Forgive us of our own sin and insincerity. Bless us with purity, righteousness, and holiness as we pledge our life to your glory. In Infant Jesus' name we pray. Amen. 24Now Thomas, one of the twelve, called the Twin, was not with them when Jesus came. 25 So the other disciples told him, "We have seen the Lord." But he said to them, "Unless I see in his hands the print of the nails, and place my finger in the mark of the nails, and place my hand in his side, I will not believe." 26Eight days later, his disciples were again in the house, and Thomas was with them. The doors were shut, but Jesus came and stood among them, and said, "Peace be with you." 27Then he said to Thomas, "Put your finger here, and see my hands; and put out your hand, and place it in my side; do not be faithless, but believing." 28 Thomas answered him, "My Lord and my God!" 29Jesus said to him, "Have you believed because you have seen me? Blessed are those who have not seen and yet believe. The apostle Thomas was a natural pessimist. The last apostle to meet the resurrected Lord was the first to go with him to Jerusalem at Passover time. When Jesus proposed that they visit Lazarus after receiving news of his sickness, Thomas said to the disciples: "Let us also go, that we may die with him". While Thomas deeply loved the Jesus, he lacked the courage to stand with Jesus in the time of his passion and crucifixion. After Jesus' death, Thomas made the mistake of withdrawing from the other apostles. He wanted loneliness rather than fellowship in his time of sorrow and hardship. He doubted the women who saw the resurrected Jesus and he doubted his own fellow apostles who also testified that Jesus had risen. When Thomas finally had the bravery to rejoin the other apostles eight days later, the Lord Jesus made his presence known to him and reassured him that he had indeed overcome death and risen again. When Thomas recognized his Master, he believed and cried out that Jesus was truly Lord and truly God! Through the gift of faith we, too, are able to distinguish the presence of the risen Lord in our personal lives. The Holy Spirit reveals the Lord Jesus to us and helps us to grow in knowledge and understanding of God and his ways. Through the gift of faith we are able to announce that Jesus is our personal Lord and our God. He died and rose that we, too, might have new life in him. The Lord offers each of us new life in his Holy Spirit that we may know him myself and walk in this new way of life through the power of his resurrection.